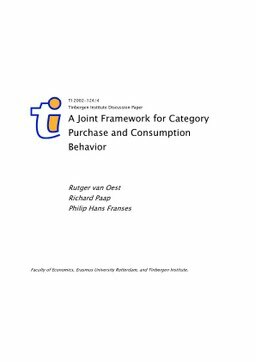 We propose a consistent utility-based framework to jointly explain a household's decisions on purchase incidence, brand choice and purchase quantity. The approach differs from other approaches, currently available in the literature, as it is able to take into account consumption dynamics. In the model, households derive utility from consumption, and they relate their purchase behavior to consumption planning. We illustrate our model for yogurt purchases, and show that our model yields important additional insights. One such insight is that the reservation price of households is not fixed, but depends on the available inventory stock. Furthermore, we find that promotional activities increase sales through more purchases in the product category and brand switching, but the effect through larger purchase quantities is limited.